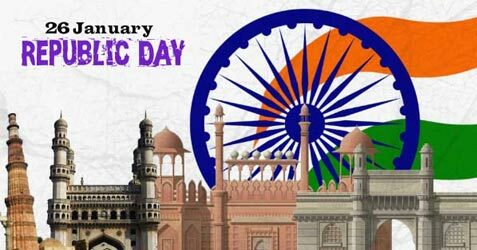 The Republic Day of India is a national holiday in India to mark the adoption of the Constitution of India and the transition of India from a British Dominion to a republic on January 26, 1950. It is one of the three national holidays in India. Although India obtained its independence on August 15, 1947, it did not yet have a permanent constitution; instead, its laws were based on the modified colonial Government of India Act 1935, and the country was a Dominion, with George VI as head of state and Earl Mountbatten as Governor General. On August 29, 1947, the Drafting Committee was appointed to draft a permanent constitution, with Dr. Ambedkar as the Chairman. A Draft Constitution was prepared by the committee and submitted to the Assembly on November 4, 1947. The Assembly met, in sessions open to public. After many deliberations and some modifications, the 308 members of the Assembly signed two hand-written copies of the document (one each in Hindi and English) on January 24, 1950. Two days later, the Constitution of India became the law of all the Indian lands. The Constitution of India came into effect only on January 26, 1950. Following January 26, 1950, Dr. Rajendra Prasad was elected as the president of India. This was, in fact, a deliberate act, signing the constitution on 26th January, to mark and respect the freedom fighters who wanted 26 January as India's initial Independence Day. To mark the importance of this occasion, every year a grand parade is held in the capital, New Delhi, from the Raisina Hill near the Rashtrapati Bhavan (President's Palace), along the Rajpath, past India Gate and on to the historic Red Fort. The different regiments of the Army, the Navy and the Air Force march past in all their finery and official decorations. The President of India, who is the Commander-in-Chief of the Indian Armed Forces, takes the salute. Also part of the parade is children who win the National Bravery Award for the year. 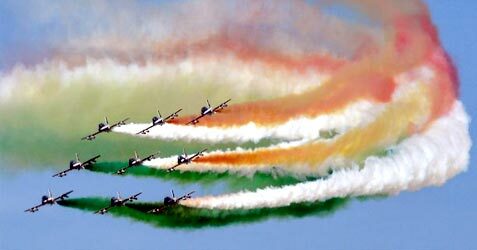 The parade also includes other vibrant displays and floats and traditionally ends with a fly past by Indian Air Force jets.